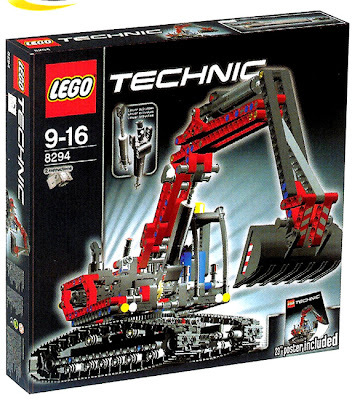 TechnicBRICKs: Images from new TECHNIC sets (Fall 2008), leaked! 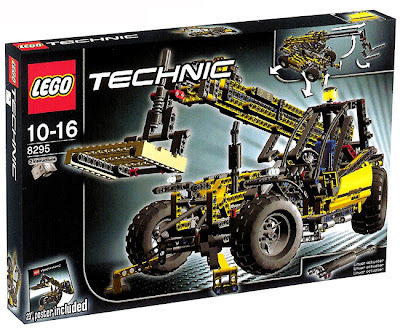 2nd half 2008 new TECHNIC sets box images, leaked at Eurobricks! This is not a PF set, but it seems to include a new TECHNIC part to "replace" or at least make the work of former pneumatic cylinders. It avoids the pneumatic system (if any wants so), but it comes with a new mechanical solution still looking realistic. These cylinders are longer than pneumatic ones, which is useful, and called at the box as 'Linear actuator'. It looks like they are mechanically actuated by connecting an external rotating axle, which produces linear movement by rotating an internal cylinder mechanism (like a leadscrew into a fake hydraulic cylinder, as used by Jennifer Clark at their 'All Terrain Crane' seen here). However I'm afraid the connection to these new cylinders could break under considerable load stress. It seems to rely on half of a 'Technic Universal Joint', which is not properly a strong part (even if it would be made of metal). Well, this yellow set... uses also one linear actuator (the same from those used on set 8294, above) and is also not PF enabled from the box. Some guess that, there could be two linear actuators, included. It's huge and much larger than its predecessor 8283. It features a Rear Wheel steering design (maybe 4WS, but not clear from the image). However as someone wrote at Eurobricks, a bit disappointing is the use again of same way how to tilt the forks. Quite unrealistic! Not much more to say, from the functional point of view. 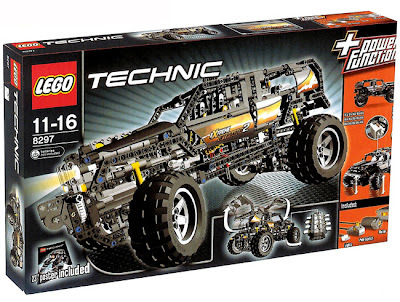 And here it is finally the 2008 TECHNIC flagship, despite not in the 150€ range (European prices) as we believe, so not in the most functional sets class. That high-end TECHNIC sets seem now to be released once every two years. However it seems to be a very good addition! Look at the sticker on the door, where it is wrote "Extreme Offroader 2" (click on image, to enlarge). This makes me think it is not a successor for the 8466 (4x4 Off-Roader), but for its small brother 8465 (Extreme Off-Roader). Despite it looks closer to 8466, guess it may lack the 4-wheel drive transmission, the gearbox and even the direct driving wheel steering control for an Hand of God (HoG) replacement. However it could be easily observed that we got a 4 wheel suspension, and from images on the box, it seems also to be adjustable for the real off-road duties ;). Look that the suspension seems to be connected to a longitudinal axle that possibly would allow to adjust its height. But the most interesting features should be the brand new Power Function elements addition ;). Real lights (PF) on the front (we voted for them in a LEGO poll at TECHNIC website a few months ago) and what seems to be a new PF Pole Reverser (from the pics, still wonder how this Pole Reverser connects and works with PF system power/control bus)..
And off course one PF Motor ('M' size !?) plus a Battery Box included, to make something to move/light. Last but not least, the front Winch was also a great and simple addition to this set. - run/stop and switch the Winch turn direction. - switch vehicle movement direction (front/backward) since IR Sensors and IR Remote are not included in the set box. Probably this is not the case, since direction seems to be manually controlled by an HoG, and it would make sense to control electrically one and not the other. - used to drive the Winch (look at the white clutch gear, just behind the Winch). - used to make vehicle move forward/backward. Probably not the case since direction seems to be manually controlled by an HoG, and it would make sense to control electrically one and not the other. Also as the motor seems to be the 'M' size one, it wouldn't be powerful enough. - are there one or two lights present in the model front? - is there one light (a LED !?) behind a light splitter like those used in LEGO Trains? - Looking in detail to the poster image on the box bottom left corner, we could clearly see to light spots. So most probably there are included two of the new PF light elements. I keep the order for ideas/suggestions above, according to what I personally think at the moment, to be the most probable function (from higher to lower). However is still uncertain if that probable gearbox is used for the tranmission or most likely to switch some motorized functions (e.g. Winch, Suspension, Headlights)!? All these new sets, will come with a 23" poster included with the box. ...and this is my PREVIEW comments for the 2008, 2nd half TECHNIC sets. IMHO all 3 sets, a 'must have' for all LEGO TECHNIC fans, I would say. Thanks LEGO, for the great design work and continuous TECHNIC theme improvement! And now just rests to see pictures of the new TECHNIC Racers F1 1:9 car, that's expected to be launched this year to... (From the last picture made available, this 8157 model looks more like a Model Team or System, than TECHNIC). Very interesting! Concerning the linear actuators, LEGO filed a patent for a very similar device way back in 1994, patent number KR940008299B. This describes a leadscrew type linear actuator which used flexible shafts (!) to drive it. The telehandler looks much larger than the last one. The "4x4" might be "Super-car-ish". I can see that it has 4 wheel suspension. It is also looks like one of the PF elements is something we haven't seen before. I wonder if this signals the end of the LEGO pneumatic system? This new system will be much easier to motorize, and the actuators will be able to resist much more load than the pneumatic actuators. The pneumatic actuators were limited by safe working pressure, so the only way to get more force would have been a bigger diameter. These threaded rods should provide much more support, especially if they are metal. If they are plastic, they may strip if overloaded. These models are the best I have seen in a very long time. They have interesting colour schemes, lots of new pieces, great wheels and tracks, and new power functions elements! I am definetely going to buy all of them, maybe even 2 of each. By the way, it looks like theres only one headlight... Its hard to tell though. This is going to be an amzing year for technic. Yes, I'm not sure also if there is one or two headlights. Well, it has three in the poster thats included, and its pretty strange to have a set with one headlight! It'll be great to combine with Mindstorms, as you can communicate with the headlight and light sensor... I think that the Telescopic loader should include 2, not 1 of these new cylinders. Its the only model that I'm not thaaaaat keen to buy it, but it does have steering, nice wheels and stabilizers. The excavator is fantastic, as it has 2 of the new cylinders for only R500! ($70) It also has the the new tracks. I wonder, do you know when these sets come out in the U.S? Here, it comes out in August, so they probably come out in June/July. The first pictures of 8275 where of a slightly different model - note the yellow panel fairings and "free game", so these pictures might not represent the final model. actuators look great cant wait! new PF Lights and manual reverser switch.. shame its not RC but the parts are for sale now cheap too. I do not think that these linear actuators will be easy to motorize. As the actuator extends, in many applications it rotates around one of its endpoints, which would make it difficult to connect the think to a fixed motor. With respect to the light: probably one light, probably a LED, with a light splitter, maybe similar that the one used in trains, to give the illution of two headlights. Humm,... that light splitter maybe the case too. Added into post notes, for the several functions possibilities ;). Hey, I've just noticed that in the bottom right corner of 8297's box, it says "lights", which, unless they've made a grammatical error, that there is more than one light. Can't wait for hi-res pics! Now I believe the winch is definitely motorized, since there is a white clutch gear, just behind it. Ha ha, two of my wishes have come true! Second, the linear actuators: a few years ago, I sent an e-mail to LEGO suggesting something like this: an axle is rotated inside a very long worm gear, which makes it extend or retract. I never got a reply from LEGO, and I believe my mail didn't have influence in this new part. It's a nice coincidence, though. Also, I read somewhere that LEGO didn't intend to have pneumatics at all, but instead a system like these new actuators. I think there was a design patent in the '70s or something like that, and, interestingly enough, a drawing of an excavator was used to illustrate it. Let's hope the two systems co-exist, since both have advantages and disadvantages! I'd say the motor is only for "auxiliary" functions, like the 8292 Cherry Picker, and, like it, possibly using a gearbox to distribute power between them. So far, I see the front winch and the suspension as potential candidates; maybe the doors can be opened too. Remember the 8480 Space Shuttle, which has 4 functions for a single motor! So, if this is true, the pole reverser would be simply to turn the headlight(s) on and off. Having it located at the cockpit would be a nice touch in "realism". Actually, I believe the 8419 is more similar, especially in the shovel linkage. Thank you very much for these pictures I have been very eager to see them. but this is such a cop out. gonna spend about £75 just to get a light bulb on wheels. Where's the gear box? where's the 4 wheel drive? Excavtor 4/10 for it's looks and tracks. Telehandler 2/10 for it's looks. decided (quite rightly) to go for the pneumatic approach, most likely because they are more realistic. Calm down, Anonymous, and wait for the sets to be launched... maybe they will be better than you expect. ;-) For example, we don't know yet if the Off-Roader has 4WD or not. I think it's too early to judge the 'cylinders' -- their strength and strain on the universal joint will all depend on the number of threads. The more threads to move a certain height means less stress on the universal (in comparison to less threads). More threads also give more height control. And add the depth of threads (surface area contact) to counterattack slippage under a load. If done right, they can be very exciting. Maybe they will give us a small or tiny PF motor in the future to control these linear actuators -- who knows what they have planned for PF. Yes, a small motor is a must for the PF line range. However for an effective and compact use with these new cylinders, it should have a reasonable rotation speed (above the LEGO predecessor micromotor), while high torque is not so important for this application (cylinder worm screw). I have that feeling too, but only about the Telescopic Handler. Both types of tire use the same wheel, as well as the tires used in the big F1 sets. maybe the arrows on the wheels are there to indicate that the model has real suspension, and nothing to do with the battery box or PF?! Well I think I know what the Motor in 8297 is good for: a hight adjustable suspension.. looks clear to me concerning the Box on the right side. Wouldn't make much sense either to use the motor for drive or steering without RC?! Anyway, I can't wait to get it! Imagine this as a LEGO actuator? It would solve some of the problems raised in this blog.